Dear CNN: Guess How Many Jobs Trumponomics Spawned Last Month - 177K? 223K? 401K? Dear CNN: Guess How Many Jobs Trumponomics Spawned Last Month – 177K? 223K? 401K? Unemployment was at 3.9 last month… were there enough jobs made to drive that number even lower? And while we’re on the topic… Is Pelosi still mouthing off about those ‘crumbs’? We’re guessing she’s talking about the economy as little as possible. Because — as she’s so quick to remind us — she was around back when they were passing these buttons out. Which itself stands as a powerful argument for term limits. But enough about Nancy… we’re talking about that Roaring Trumpian economy. The one certain ‘experts’ were promising would ‘flame out’ if Americans were reckless enough ever to get Trump elected. But it never did flame out, did it? The ‘experts’ were wrong. On the other hand… it behaved exactly the way Trump predicted it would. 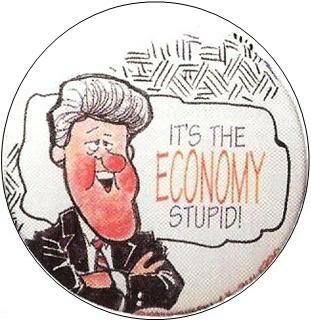 He slashed red tape, and cut taxes, and the economy blew up… in a good way. Which leaves a lot of egg on the faces of everyone who predicted that Obama’s sucky ‘recovery’ was ‘the new normal’. That we wouldn’t see those big growth numbers anymore. Well — we’re seeing them now, aren’t we? Where are those ‘experts’ now? So… that’s better than predicted. Again. White unemployment is 3.5 percent, while Hispanic unemployment is 4.9 percent. Black unemployment is 5.9 percent — a new record low down from 6.6 percent the previous month — while Asian unemployment came in at 2.9 percent. “Average hourly earnings increased 2.7 percent from a year earlier, more than projected, while the jobless rate fell to 3.8 percent from 3.9 percent to match April 2000 as the lowest since 1969,” Bloomberg reports. That claim that ‘racist’ Trump will hurt minorities falls a little flat when Black unemployment numbers are coming in at a NEW RECORD LOW… and Hispanic unemployment stats are even lower than the white unemployment numbers. But our President is ‘bad’ for minorities, right? His promise was to make America a place of better opportunity for ALL Americans. When the midterms roll around, that’s the measuring stick they’ll use to judge the President’s record, and whether they want a Congress that should align with or (as they love to say) ‘Resist’ his winning formula. If you’re looking for reasons that ‘blue wave’ is evaporating… here’s a good clue to start with. And we all know the ‘news’ networks — like CNN — certainly haven’t got a clue on their own. 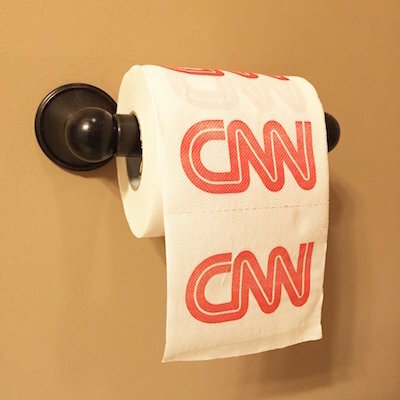 CNN — all the news that’s fit to flush. Are you tired of the fake news that spews forth from CNN and the lame-stream media? Well, you don’t have to put up with their crap any more! Clash Daily is proud to release a very special brand of toilet paper! Send to your liberal friends so that they can wipe their minds clear of the waste produced by the Communist News Network!